Adverse drug cutaneous reactions are a major concern for physicians worldwide. Drugs may cause mild-to-severe reactions such as urticaria, maculopapular rash, toxic epidermal necrolysis, erythema multiforme, and hyperpigmentation or hypopigmentation of skin. Abnormal pigmentation of skin is a less morbid condition but can be more distressing to the patient and a major cause of psychological distress. The incidence of drug-induced skin pigmentation accounts for nearly 10%–20% of all pigmentary disorders. Usage of antimalarials, antibiotics, tranquilizers, and chemotherapeutics is a common cause of drug-induced hyperpigmentation apart from usage of systemic chemotherapy. The pathophysiology of drug-induced hyperpigmentation is not known, but the probable mechanisms include deposition of drug in soft tissues as in the case of usage of heavy metals such as lead and gold and increased melanin production by stimulation of melanocytes or by chelation of drug metabolites with the existing melanin. Hyperpigmentation also results from deposition of iron in concealed hemorrhage and postinflammatory blood vessels.,, These hyperpigmented spots usually require no treatment and disappear in around 4–5 months. Disulfiram, a carbamate derivative, is an aldehyde dehydrogenase inhibitor which prevents the degradation of primary metabolite of alcohol metabolism, acetaldehyde. Accumulation of this primary metabolite in tissues and blood causes a number of highly distressing symptoms such as sweating, flushing, headache, nausea, and vomiting. The only available pharmaceutical form of this drug is oral tablets with the average maintenance dose of 250 mg (range: 125 mg–500 mg). This tablet has to be taken once per day and should not be administered until the patient has complete abstinence from alcohol for the past 12 h. The patient should also be abstained from consumption of alcohol and alcohol-containing products for the next 14 days postcompletion of disulfiram therapy. The common side effects of disulfiram include palpitations, chest pain, vertigo, thirst, muscle weakness, and headache. The incidence of disulfiram-induced dermatological disorders corresponds to an intermediate rate of adverse reactions (1 in 200) and comprises urticarial, exfoliative dermatitis, and rash. Disulfiram-induced hyperpigmentation is a very rare phenomenon, and in this submission, we report a case of disulfiram-induced hyperpigmentation in a 42-year-old male getting treated for alcohol dependence. This is the first such adverse reaction reported to the best of our knowledge [Figure 1]. A 42-year-old male patient came to the drug deaddiction center at PGIMS, Rohtak, a tertiary care center for treatment of alcohol dependence. He was a chronic alcohol abuser for the past 21 years with a regular intake of alcohol every day. This alcohol intake was also accompanied by smoking with an average consumption of 18–20 cigarettes per day. As per history, many times, the patient and his family members tried to stop/decrease his alcohol consumption but he suffered from serious withdrawal symptoms of abnormal body movement with tongue bites and clenching of the teeth along with a history of urinary incontinence, and therefore, he was brought to deaddiction center. He was put on deaddiction therapy by prescribing tablet disulfiram 250 mg orally once daily. After the intake of disulfiram for 2 weeks, the patient noticed dark pigmented spots on his trunk, but these spots were not accompanied by any symptoms of itching, scaring, and redness. On examination, the patient was afebrile and had no blisters, purpura, or pustules on his trunk. There was no involvement of the mucous membrane, and all routine blood investigations such as complete blood count, kidney function tests, lipid profiling, and random blood sugar were within normal limits. The liver function test showed derangement with increase in serum alanine (serum glutamic oxaloacetic transaminase >145 U/L) and serum aspartate (serum glutamic pyruvic transaminase >76 U/L) levels. Two years back, also the patient had undergone deaddiction treatment at PGIMS, Rohtak, where he was prescribed tablet disulfiram 250 mg orally once daily. 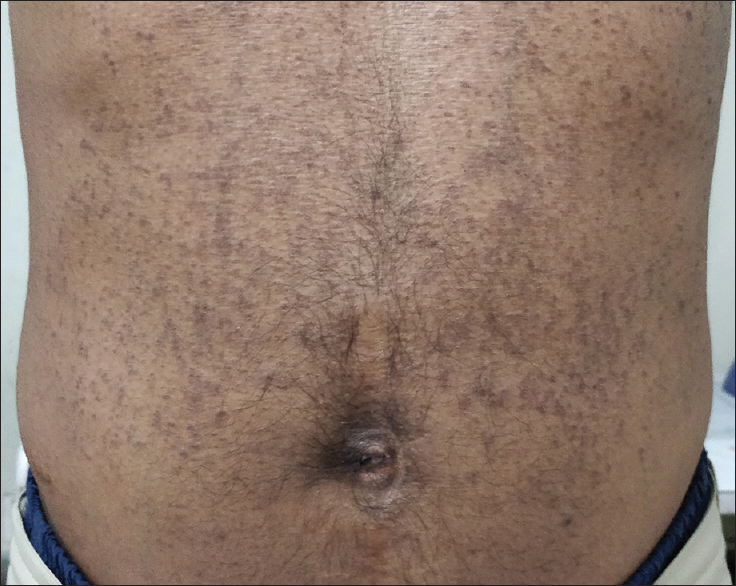 After 2 months of treatment, the patient had noticed similar dark pigmented spots on his trunk, and there was no history of fever, itching, scarring, and redness. The patient also gave a negative history about any blister, purpura, or pustule on his trunk. The potassium hydroxide wet mount was found to be negative. The patient then abruptly stopped consuming the drug and started consuming alcohol once again on regular basis. It took 8 months for these dark hyperpigmented spots to get resolved. Looking at history, in the present episode, the intensity of these hyperpigmented spots was found to be more intense, and they appeared early. The drug was withdrawn under the supervision of medical opinion. An adverse drug cutaneous drug reaction to disulfiram was suspected from the history and clinical examination. Disulfiram is not the usual preferred first-line drug for treatment of alcohol dependence; nevertheless, it is widely used because of its efficacy in particular patient groups. It is associated with extensive drug–drug interaction, and therefore, risk profile is well known. Most common adverse effects include headache, halitosis, tiredness, and muscle cramps. Disulfiram-associated dermatological disorders are rare and least reported which include exfoliative dermatitis, rash, and pruritus. The differential diagnosis of hyperpigmentation includes ethnic pigmentation, due to systemic diseases such as Peutz–Jeghers syndrome, hemochromatosis, smoking-related complications, as well as posttraumatic or postinflammatory hyperpigmentation. In the present case, the patient had stopped the medication on his own due to hyperpigmentation caused by the drug which later subsided. It was prescribed again 2 years later, leading to reappearance of hyperpigmentation. On causality assessment as per the World Health Organization – Uppsala Monitoring Center scale, it was found to be “certain” due to positive rechallenge. A diagnosis of disulfiram-induced hyperpigmentation was made. Counseling of the patient was done, and he was instructed to discontinue the drug. Hyperpigmentation of the skin even though being an adverse drug reaction of mild in nature can cause distress to the patient and can lead to withdrawal of drug therapy. Therefore, physicians need to be aware of this adverse drug reaction, and hence, proper counseling of the patient needs to be done for such cases as the correct diagnosis can only be made by properly elucidating the history and from the other case scenarios. Valeyrie-Allanore L, Sassolas B, Roujeau JC. Drug-induced skin, nail and hair disorders. Drug Saf 2007;30:1011-30. Scully C, Bagan JV. Adverse drug reactions in the orofacial region. Crit Rev Oral Biol Med 2004;15:221-39. Argenyi ZB, Finelli L, Bergfeld WF, Tuthill RJ, McMahon JT, Ratz JL, et al. Minocycline-related cutaneous hyperpigmentation as demonstrated by light microscopy, electron microscopy and X-ray energy spectroscopy. J Cutan Pathol 1987;14:176-80. Li CC, Malik SM, Blaeser BF, Dehni WJ, Kabani SP, Boyle N, et al. Mucosal pigmentation caused by imatinib: Report of three cases. Head Neck Pathol 2012;6:290-5. Wong M, Sade S, Gilbert M, Klieb HB. Oral melanosis after tyrosine kinase inhibition with imatinib for chronic myelogenous leukemia: Report of a case and review of the literature. Dermatol Online J 2011;17:4. Franck J, Jayaram-Lindström N. Pharmacotherapy for alcohol dependence: Status of current treatments. Curr Opin Neurobiol 2013;23:692-9. Enghusen Poulsen H, Loft S, Andersen JR, Andersen M. Disulfiram therapy – Adverse drug reactions and interactions. Acta Psychiatr Scand Suppl 1992;369:59-65. WHO-UMC Causality Assessment Scale. Available from: http://www.who-umc.org/pdfs/Causality.pdf. [Last accessed on 2018 Apr 30].